What do you know, twice is quick succession I post about Tesco, first they complete their Sugar Tax Fix and now they are tackling the housing crisis by way of selling their “Air Rights”. The whole concept of air rights is a complex one, but basically you own the air above your property to build up. Pre-21st Century geo-dependant anyone who owned land had unlimited air rights to build straight up. There were some limitations about blocking adjacent property and other issues. In principle though, you own the rights to the air above your property. It does seem complicated in non-freehold leases but this post isn’t about air rights, so I’ve skimmed it. 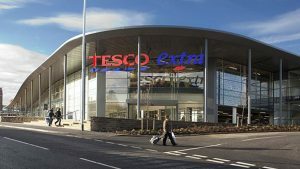 Tesco own around 5,000,000 sq meters of land in the UK, it maybe even more than this as the data I could find is years out of date so I have rounded it up. At one point (2014), the empty undeveloped land Tesco owned could hold 15,000 new build homes in 310 locations. Which is all well and good but much of this land is outside town centres in semi-industrial areas, who wants a house at ground level next to a motorway or industrial estate of highly commercial areas. I can only use Manchester as an example. We have the Beetham Tower, regardless of your opinion eyesore or marvel, its 47 floors, well 48 as the top floor is Duplex. The first 24 floors are a Hilton Hotel including the Cloud bar the 23rd Floor. 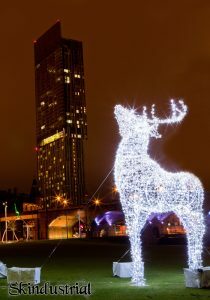 Floors 24 up are various sizes of apartments and flats with residents such as footballer Mario Balotelli, all the way up to Floor 47 which were Ian Simpsoms immense Duplex Penthouse. Up the road in Piccadilly Gardens there are rows of shops at street level, and over the top Offices, Hotels and Different Shops. Its not a new idea to put accommodation over the top of retail locations, what is interesting, once you rise up, the geographic issues fade in to the background. I have stayed on floors 9, 15, 21 as a hotel guest and spent a day in an apartment on floor 37 for a photoshoot. The higher up you go, the less you notice the city, and there is literally no external noise. In recent times the whole process of putting flats or apartments on top of existing developments involves the actual flats being built off site and transported and crane lifted in to place. Almost like flat pack homes, which is why they generally go up like a missile in no time. One of the advantages is that this type of building is dirt cheap, quick to build and its essentially free money for the actual ground owner selling their air rights. Tesco seems to want to earn both a position of saviour of the UK people and save its own skin. Assuming it keeps the prices of these properties low, Tesco may just have found its golden goose. I just hope Tesco maintains some control and actually produces cheap housing. Tesco image Courtesy of Tesco.